Noor Jehan (Urdu: نور جہاں) was the adopted stage name for Allah Wasai (September 21, 1926 – December 23, 2000). She was a Pakistani singer and actress. She is renowned as one of the greatest singers of her time in the Indian subcontinent and was given the honorific title of Mallika-e-Tarranum (Urdu: ملکہ ترنم, English: the queen of melody). She achieved special national recognition and popularity in Pakistan with her patriotic songs of 1965, which elevated her to an iconic level. Along with Ahmed Rushdi, she holds the record for having given voice to the largest number of film songs in the history of Pakistani cinema. She is also considered to be the first female Pakistani film director. 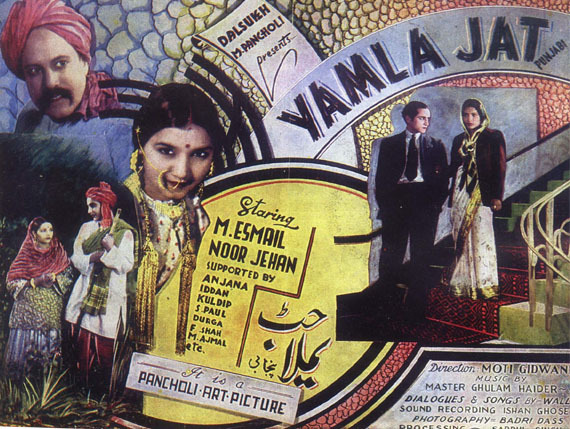 Noor Jehan was awarded the Pakistan President's Award in 1965. She married Shaukat Hussain Rizvi in 1942. The marriage ended in 1953 with divorce. The couple had three children, including their singer daughter Zil-e-Huma. She then married Ejaz Durrani in 1959. The second marriage also produced three children. It ended in divorce in 1970. In 2000, Jehan was hospitalized in Karachi and suffered a heart attack. 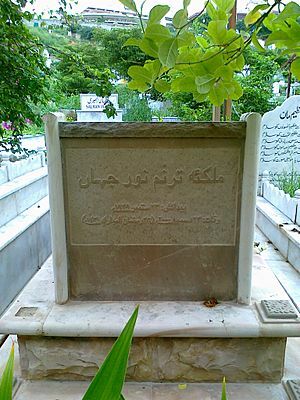 Jehan died as a result of heart failure. Noor Jehan Facts for Kids. Kiddle Encyclopedia.